Update: Continuing to perform impressively on the Stellarport exchange, the GTN token effortlessly maintains its $0.30 price level into April 2019. 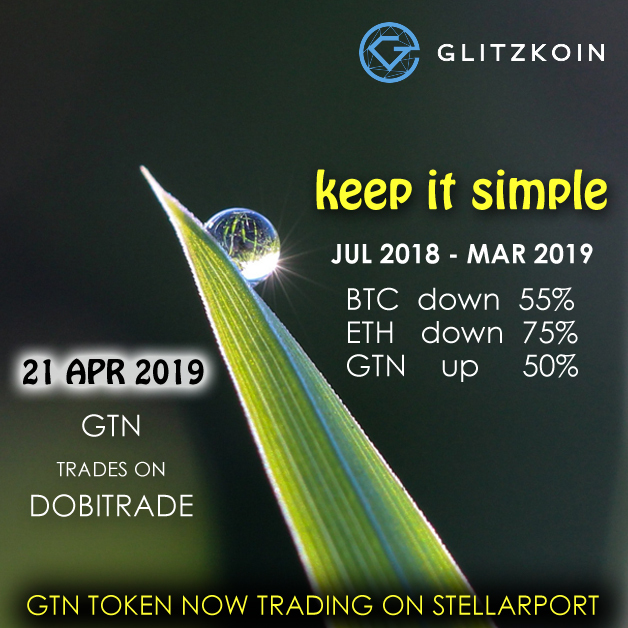 Another positive news is that, the GTN token will soon begin trading on the DOBITRADE exchange (starts 21 April 2019). DOBITRADE is powered by high traffic and high trade volumes. Traders can pair the GTN with BTC, ETH and the US$. The listing exposes the Glitzkoin GTN token to a significantly larger crypto audience. This should have a positive impact on the price of the token. It might seem a bit strange to make a comparison between, the stalwarts of the crypto world and the Glitzkoin GTN token. But recent events have proved that big, prices do not imply stability and high potential. In this report we make a very simple and effective comparison between Bitcoin, ETH and GTN. We basically evaluate the performance of each token during, the July 2018 to January 2019 period. 7 months is a long enough period to review a crypto and make, an assessment of its potential. We need to clarify why the July 2018 to January 2019 period, was selected to make this comparison. The Glitzkoin ICO ran from March 2018 to June 2018, the GTN token was priced in the $0.15 to $0.20 range during the ICO. The token was listed (July 2018) on the Stellarport exchange after, the successful completion of the ICO. January 2019 happens to be the first completed month of the year 2019 at the time, that we publish this report. So here is what happened to GTN, BTC and ETH during the July 2018 to January 2019 period. Bitcoin was priced at around $7,700 in July 2018. It began its descent in November 2018, and stood at a disappointing $3,500 in January 2019. This amounted to a loss of around 53%. ETH told a similar story, priced at around $435 in July 2018, the crypto dropped to a low of $107 in January 2019. In terms of percentage points, that is a staggering loss of 75%. Now on to the Glitzkoin GTN token. Trading on the Stellarport exchange at an approximate price of $0.20 in July 2018, the token received strong support from seasoned crypto toward the end of 2018. This ensured that the GTN ended the year at $0.30 and maintained that price, through January 2019. A clear 50% appreciation in price for this token. Without getting into a sales pitch, here are some thought provoking notes related to the information provided above. The crypto world has relied heavily on a handful of cryptos, this should ideally change. The fact that crypto traders continued to support a strong project, like Glitzkoin even in a bearish market shows maturity. We can now be sure that a high crypto price, does not always translate into sustained value. A brief summary of the Glitzkoin project and the GTN token is provided below. This is something that, every crypto enthusiast should read. It defines the essence of an industry based blockchain, that is focused on the real world economy. Analysts agree that this should be the trend for the future. Glitzkoin Project Summary: Focused on improving productivity and market scope for the 90 billion dollar diamond industry, the Glitzkoin diamond blockchain project is promoted by second generation diamond veteran Navneet Goenka. The project includes a fully functional diamond trading platform – DiaEx. Designed to support B2B and B2C trade in diamonds, the DiaEx platform uses the GTN token to settle payments. The Glitzkoin management team recognizes two groups of stakeholders. The diamond community is happy to have its own tech based trading solution, it also welcomes the GTN crypto. Diamond traders have for long, hoped to have access to a payment mode that did not involve the cumbersome and expensive banking system. The crypto community that has consistently supported the project, also has a clear stake in Glitzkoin. Ongoing efforts are aimed at increasing the usage of the GTN token, something that should please seasoned crypto traders. In January 2019, Glitzkoin unveiled an exciting partnership with online ticketing giant, Myticket.asia. Scheduled for a 2019 first quarter implementation, this deal will soon allow visitors to the portal to pay for their purchases with the GTN token. The DiaEx diamond trading platform is eagerly awaited by, the diamond industry and the crypto community. To be launched in the first quarter of 2019, the platform would further add to the demand of the GTN token.